Alchemist, Other software dynamics processor from Flux ::. Product replaced by the Flux :: Alchemist v3. 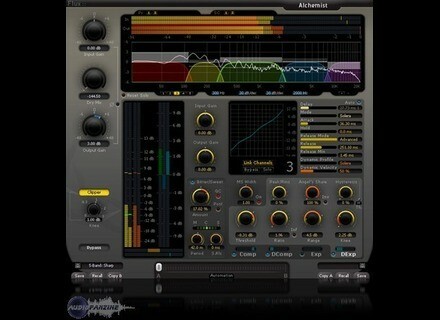 Alchemist is a sophisticated multi-band processor. Based on the acclaimed Flux dynamic processing algorithms, Alchemist features a state-of-the-art IIR cross-over with selectable slopes from 18 dB per octave to 54 dB per octave, with variable corner frequencies. Every band owns a complete dynamic processing section including compressor, expander, de-compressor, de-expander, working in parallel with independent Angel’s Share and Hysteresis parameters. A transient processor and a MS controller are also available for each frequency band. The sound can be processed from single broadband to five bands. The whole processing is completed by an adjustable soft knee clipper. Flux :: Solera II According to Flux, Solera is the result of much thought on the control of the sound dynamics, carried out for many long years by the FLUX team. Waves Z-Noise Waves Audio has added its Z-Noise noise reduction processor to its Restoration, Broadcast & Production and Diamond bundles. 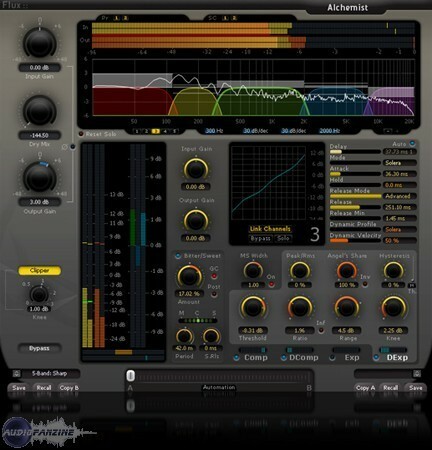 Voxengo Crunchessor Updated to v2.3 An updated version 2.3 for Voxengo Crunchessor is now available for download.